The data-storage specialist calls this an "excellent capital allocation opportunity to enhance long-term shareholder value." Storage giant Western Digital (NASDAQ:WDC) announced on July 26 that its board of directors had authorized a brand-new $5 billion stock buyback program. That program will replace whatever programs Western Digital had in place; this $5 billion isn't in addition to any previous stock buyback authorizations. 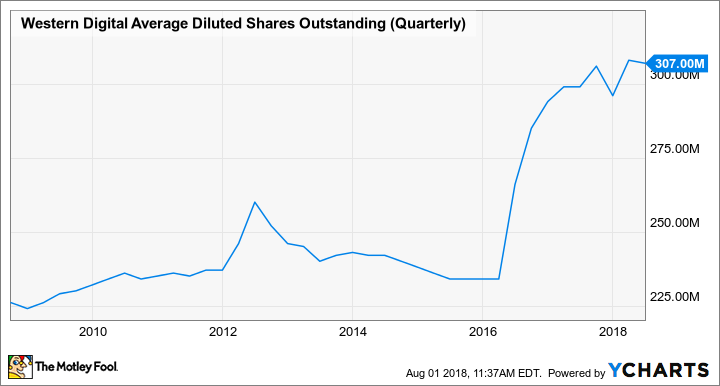 "We believe today's announcement is an excellent capital allocation opportunity to enhance long-term shareholder value," Western Digital CEO Steve Milligan said on the company's most recent earnings conference call. Let's take a closer look at this buyback program and what it could mean for Western Digital's stockholders. A stock buyback can help to boost a company's earnings per share. Remember that earnings per share is net income divided by the total share count, so for a given level of net income, a lower share count will mean higher earnings per share. Now, some buyback programs do little more than offset what would otherwise be a rising share count due to things like share-based compensation. Other programs are more aggressive and can lead to significant reductions in share counts, translating into noticeable earnings-per-share increases. Western Digital's market capitalization (based on a share price of $69.79 and a fully diluted share count of 307 million) stands at approximately $21.4 billion. This means that the new repurchase program that the company put into place is good for nearly a quarter of the company's shares outstanding. The company's share count has risen dramatically over the last several years, so this new program should help reel it back in. According to CFO Mark Long, the company is "targeting repurchasing $1.5 billion of our common stock over the next 12 months depending on market conditions," so don't expect this program to be fully utilized anytime soon. As of the current price, the amount of its own stock that Western Digital is aiming to buy over the next 12 months is good for around 21.49 million shares, or 7% of the company's total diluted share count. Western Digital has a lot of debt, with a lot of it coming from the company's acquisition of solid-state drive maker SanDisk. As of the company's most recent quarter, it had $10.99 billion in long-term debt (down from $12.92 billion in the same quarter a year ago). During the call, analyst Sherri Scribner asked Western Digital management if the "buyback announcement [is] sort of a signal that you feel comfortable with your debt where it is or do you think you'll still reduce some of the leverage that you have?" So as we highlighted, we've a balanced capital allocation strategy, and we are still committed to deleveraging as one of our priorities. At this point, we do have more flexibility because we've been able to restructure our debt and we've been paying it down, so we're comfortable with where it is. We expect to continue to delever over time, and as we talked about, we're very happy with the way we brought down our interest expense through our debt restructuring transaction. So we feel like we're able to do both, and we're able to allocate the right amount of capital to running our business as well. So it would appear that investors should expect Western Digital to keep paying down debt even as it buys back stock.